Holidays: Celebrate every chance you get. Why not celebrate them all? A really fun Nice concept, the all-winter-season-holiday card. This hand-drawn, pan-holiday greeting has shelf life – and looks great ON the shelf. The reverse side features a little background or bit of interest on our winter season holidays. Happy Miscellaneous Winter Season Holiday – in short – HahhM-WiSH! Ha(ppy) M(iscellaneous) Wi(nter) Season Holiday! Huzzah! Wish your friends and loved ones the best of the holiday season with a card celebrating Christmas, Hanukkah, Kwanza, Diwali, Winter Solstice, Dia de los Muertos, Native American traditions, Ramadan, and New Year’s Eve. Turns out, HaM-WiSH cards aren’t just artful, awesome greetings. They’re extremely convenient. Do you like to mail early, before the holidays loom? HaM-WiSH cards can be mailed as early as late October and you’ll beat the crowd with a nice, heartfelt card they’ll enjoy for weeks. I love the explanations of the holidays and the fact that the inside is blank and ready for your own custom sentiment. Diya lamp lit for Diwali, the Hindu Festival of Lights. Ramadan is observed with prayer, fasting & charity. 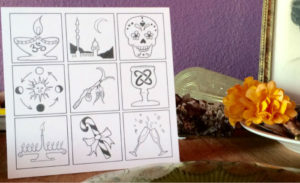 Dia de los Muertos honors & celebrates the deceased. Winter Solstice marks the shortest day & longest night. Prayer Stick for Native American ancestors on Solstice. Menorah for Hanukkah, the Jewish Festival of Lights. Candy Canes evoke Jesus Christ’s shepherd crook. Umoja Cup stresses community unity during Kwanzaa. New Year’s Eve brings festivities & a new beginning. ← NewerWinter Solstice: Turn to the light. Older →Giving Tuesday: A Retail (r)Evolution.